Readers will recollect the series of articles in Worcestershire Record No. 20, April 2006, on the unprecedented invasion of hawfinches into Britain in the winter 2005-2006. Following on from those reports and articles in the local press I was accosted by a lady in Pershore! A bird she thought was a hawfinch had appeared in her kitchen in Fladbury in January 2005, possibly brought in by a cat after perhaps colliding with a window. It died shortly afterwards and it was buried in the garden. Later, her husband, David Day, contacted me and kindly agree to an exhumation to confirm the identity, and because I had expressed an interest in seeing the skull! Eventually, at 11am on 24th May 2006, the deed was done. Although the body and most of the feathers had decomposed I was able to retrieve the skull intact and it can be seen in the accompanying pictures. It is an amazingly strong structure in life clothed with huge muscles to prevent dislocation of the jaw when the bird applies a high crushing pressure to fruit stones and seeds. Measurements have indicated that a crushing load of between 60 and 95 lbs is necessary to open a cherry stone (Mountford 1957): the kernels are a regular source of food for hawfinches. These measurements are on the small size (even allowing for the lack of muscle, skin and feathers) compared with those given by Cramp & Perrins (1994) which suggests that the bird may have been a female. Also the ridge on the back of the skull does not appear fully developed which suggests the bird may have been a youngster in its first winter. 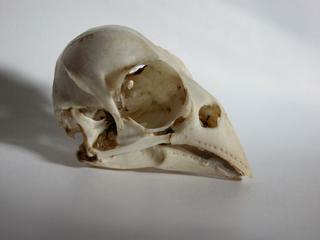 Hawfinch skull. 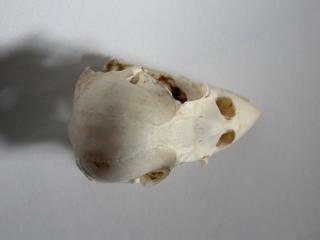 Note the ridge at the back of the skull which becomes heavier in adult birds, the heavily built quadrate, and the massive posterior orbital process. Diagram of hawfinch skull modified from Mountford 1957. Compare with the pictures above. Post.orb. proc = posterior orbital process. Interestingly the Fladbury hawfinch was found very near the church where there are many yew trees. Many of the 2005-2996 hawfinches were feeding on yew berries. MOUNTFORD G. 1957. The Hawfinch. Collins. London. CRAMP S & PERRINS CM. 1994. The birds of the western Palaearctic. Volume 8:846-847. OUP.